It’s good to see some new releases on SZ again, after what seems like a long hiatus. 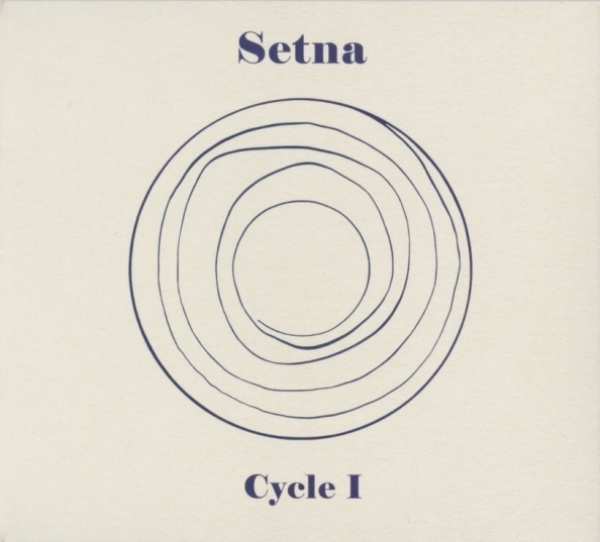 Setna is a French six-piece of drums, bass, soprano sax, two keyboards (Rhodes and Mini-Moog), and female singer Natacha Jouët, along with guests on guitar (James MacGaw from One Shot, no less), percussion, additional Rhodes and vocals. Cycle I is their first album, though it sounds like the work of seasoned professionals with many previous releases to their credit. The band has that innate and keen ability to slowly build tension and energy in a dark, linear, chamber sort of way, much like the long, building passages of Köhntarkösz, with the overall steady rise in power increasing as a piece goes. Overall, the music tends to have a quiet, cyclical and introspective vibe, although somewhat jazzy due to the extensive use of Fender Rhodes (sometimes double and triple layered) and sax soloing. The vocals tend to fluidly mix together with all the other instrumentation, becoming a unifying factor in the compositions as opposed to a focal point for a piece. There are nine tracks here of varying length, but any one tends to feed the one that follows, morphing as it goes; in the end the disc seems like one long multi-part suite, although it still manages to hold up strong taken one track at a time. All said, this is a very impressive debut.